Twitter released its diversity numbers on Wednesday afternoon after mounting pressure from civil rights groups — and they’re pretty bad if you’re not a white or Asian guy. 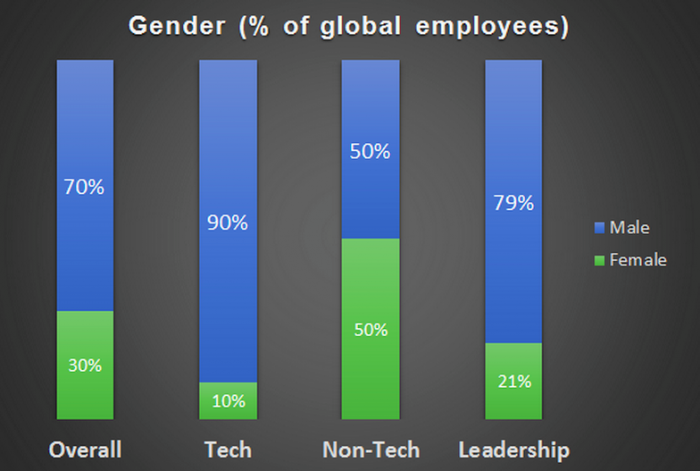 Overall, Twitter’s employees are 70 percent male and 30 percent female. However when you look specifically at employees in tech, the gender gap grows, and 90 percent are male. Looking at ethnic diversity, 59 percent of employees are white, and 29 percent are Asian. Only 2 percent of employees self-reporting as Black or African-American and 3 percent Hispanic or Latino. This is a stark contrast from the company’s user base, which has had a disproportionately high following among African Americans for years. Twitter released the report after a social media campaign by Color of Change and Rev. Jesse Jackson’s Rainbow Push Coalition called for more transparency about diversity from Silicon Valley companies. Unfortunately this breakdown isn’t a surprise if you’ve been following our coverage of similar Silicon Valley companies. Twitter’s numbers seem to be on par with those at Facebook and Google, who reported about 70 percent of their employees were male. Both also said about 60 percent of their employees are white. LinkedIn and Yahoo’s were slightly better. Both reported gender breakdowns of about 60 percent male and 40 percent female, and about 50 percent of employees at both companies reported they are white. Apple has yet to issue its own report, but CEO Tim Cook has said the company will release it soon. She says the company is also actively taking steps to recruit from underrepresented groups at women’s colleges and historically black universities. They invested in Girls Who Code during its seed funding round, and have a partnership with Year Up, an internship program for low-income students. The company just hosted Hillary Rodham Clinton on Monday in front of screaming members of Girls Who Code. Clinton spent a good portion of the beginning of her Q&A fielding questions about female empowerment from the likes of Kerry Washington, Amy Poehler and Melinda Gates. It’s good that Twitter and companies like Google are aware of this problem and are acting now, but it’s clear that this is a problem for most companies in Silicon Valley, not just a few. Last night I attended an intern networking event. About 2,000 interns registered for the event online, and only about one-third were women. Of those I spoke to, about half were interested in pursuing tech jobs specifically. This problem isn’t going away anytime soon. Although the numbers are discouraging, at least more companies are following Google’s suit and releasing them. If companies with resources like Twitter and Google can’t recruit a diverse set of employees, which ones can?